We've been at it since about 2012, when we started playing in the gym at the Appleton YMCA, despite the fact that we had no lines on the floor, and it was not certain that we could rustle up four players for a game. Things have improved. We now have dozens of active players and that same YMCA now has five different courts striped for pickleball, and at least two of them are available every weekday during the winter, with a third reserved exclusively for weekend pickleball play. What about outdoor pickleball? At this point in the year, outdoor play is just a dream. Our outdoor season has come to an end as the trees strip bare and the beautiful Wisconsin summer is gone. Most of our local play will be at the Appleton Y or the Alliance Church. The beautiful logo above was designed for us by Steve Stone of the Quad Cities Pickleball Club, and he is the sole copyright holder. Needless to say, it cannot be used, modified, profited from or reproduced without his permission. 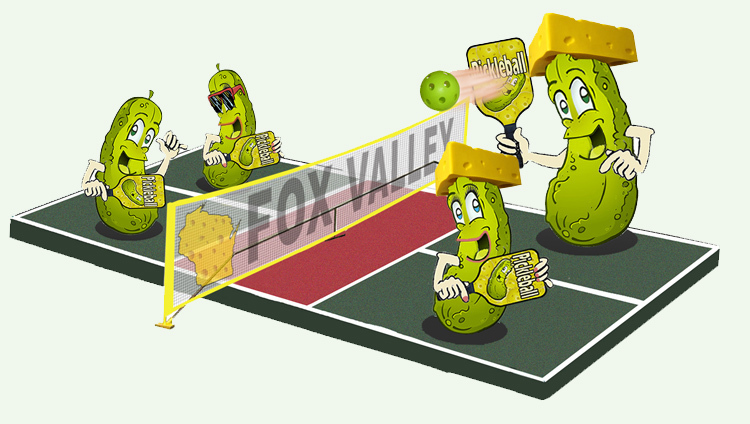 Contact pickleballiowa@gmail.com.